Take back control of your own bath – and help it realise it’s full potential. Block that pesky safety overflow drain, and fill it to the depth YOU want. What’s so great about bath is the feeling of sinking into its warm luxurious depths and unwinding completely – it really is the definition of bliss. However, if you love a good bath you’ll know that unfortunately our modern bathtubs have restricted the enjoyment of the bath through overflows, which dramatically restrict the volume of water a bath can hold. And it’s difficult to really relax in the warm depths of your bath if it feels like you’re actually just sitting in a lukewarm puddle. Of course, overflow holes carry out the important task of preventing large scale flooding and damage to the house, which is indeed a noble function. However, often they’re placed rather low in the tub, making a shallow bath even shallower. Even if the overflow is higher in the tub, it still cuts back the water level by a few inches, which can really make the difference between a luxurious soak and a mere simple splash-about. What you can do to get around this, and safeguard your precious moments of relaxing and unwinding, is to use this little durable vinyl cover to temporarily seal the overflow and increase the capacity of your bath just that crucial wee bit more. Actually, overriding your overflow can even increase the volume of water in your tub by up to 60% – which is a seriously delightful prospect when considering a bath. Not only will the water level increase, but the added volume will also help keep the water warmer for longer, allowing for a longer and even more relaxing soak. 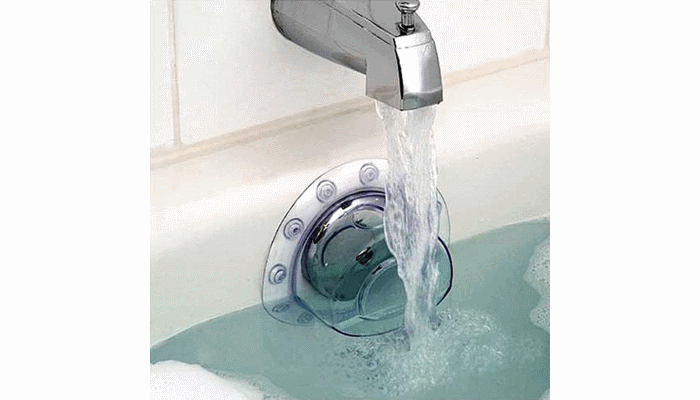 The Fill Your Bath Overflow Cover includes suction cups for direct,easy attachment over the overflow, and is mildew-resistant and machine washable.